Opened August 2015, Habitation Furnishing + Design is celebrating its third anniversary in a big way. Several changes are in the works for the St. Louis Park showroom, including new products and suppliers, updated interiors, and new amenities for its customers. While the list of products and suppliers is expanding, many of Habitation’s go-to brands will remain firmly entrenched in the showroom. The store still proudly displays the largest collection of Noir/CFC Furniture in the Twin Cities and remains the exclusive retailer for the ever-popular Gus Modern line, but some fresh faces, including Trica of Canada, Lazar, and Trowbridge Art of London have arrived. 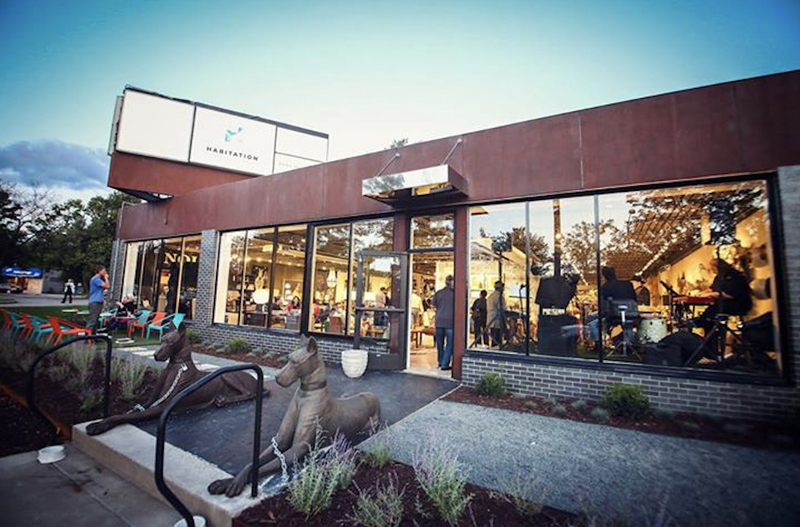 Habitation is also freshening its look with a new logo, an updated design center, and new faces on the staff, including Showroom Director Lena Lopesio, former owner of Vogue Furniture in Bloomington. That said, some of the finer points of the showroom remain, such as the 150-inch wall of TVs that allows clients to view special order products in full scale and the much beloved Great Dane statues that still greet shoppers at the front door. New amenities will be rolling out this year as part of Habitation’s third anniversary as well. Starting Aug. 1, all Habitation furniture purchases are automatically covered by Guardsman’s full five-year insurance program. The program insures against stains, tears, gouges, and just about any other common problem furniture owners may encounter, all at no additional cost. Another new boon is the start of Habitation’s full trade-in program on furnishings purchased in-store and from other brands. All Habitation merchandise (excluding accessories) can be traded, within the first five years, in exchange for a 30 percent store credit on new items. The items must be in good condition, but given that Guardsman’s insurance program sends cleaning crews to your home in the event of stains and damage, there’s no reason your sofas, chairs, tables, and other items won’t remain beautiful. And if you didn’t buy your dining table from Habitation but are ready for a change, the store has you covered. In most circumstances, the store will issue credit on your gently used items which will be collected when your new items are delivered. Some might ask, “What happens to the used merchandise once Habitation takes it away?” This fall, the store plans to launch its new sister company, Designer reHab, which will feature closeout, clearance, and consignment merchandise. Construction is already under way at the expected new location on West Lake Street in St. Louis Park.